In Central and Eastern Europe, as in most other economies, the food products, beverages and tobacco sector (hereafter called 'food sector') is a central part of manufacturing, both in terms of production and employment. Procuring raw materials from agriculture, it supplies a wide range of products (meat products, processed fruit and vegetables, milk, bread, sugar, beer, wine etc.) for final consumption, with high and steady demand insulating it from cyclical pressures. However, during the transition, food output and exports to the European Union stagnated in the Central and Eastern European countries (CEECs), while a high inflow of foreign direct investment facilitated restructuring and modernization. 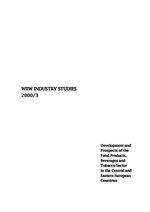 Part One of the study investigates the development and prospects of the food sector in general, Part Two presents a more thorough micro analysis and selected company profiles. Both parts cover the following countries: Bulgaria, the Czech Republic, Hungary, Poland, Romania, Slovakia, Slovenia. In size, the food sector is the largest segment of manufacturing in most CEECs today and contributes between 14% of manufacturing output in the Slovak Republic and about one quarter in Bulgaria and Romania. Continued specialization on the sector occurred in Hungary, Poland, Bulgaria and Romania, while it has always been less prominent in the Czech Republic, Slovakia and Slovenia. On the EU market, in 1989, exports of CEECs' food products had a market share of about 6.4% in total EU imports, which decreased to 5.5% in 1998 (all shares without intra-EU trade). During transition, the food sector's position deteriorated and lay below market shares of total manufacturing in 1998 (about 8%). On the Austrian market, CEECs' exports had a decisively larger share, accounting for 31% of Austria's non-EU imports of food products in 1995, increasing to 50% in 1998. However, the CEECs are also a major export destination for Austrian food exports and absorbed about 42% of Austria's non-EU food exports in 1998. Ultimately, the CEECs registered a trade deficit with Austria. Only Hungary and Bulgaria did achieve a trade surplus. Future prospects of the food sector will be strongly influenced by the development in agriculture, the demand for food products on domestic markets, to a lesser extent also on export markets and in particular by a future EU accession. For the time being, adverse factors in agriculture are hampering rather than promoting the successful development of the food sector. On the domestic market, growth prospects for the food sector are less than for GDP and decline with a higher income level as the income elasticity of food products is typically less than one. On the export markets, export possibilities to the former Soviet Union will improve with the recovery of the region from the Russian crisis. Future export growth to the European Union will depend on the results of the accession negotiations. Compliance with EU directives and the reduction of government interventions required for EU accession will put pressure on many companies and enforce restructuring. Hence overall, future prospects for the CEECs' food sectors are rather restrained, though there is a growth potential for high value added and/or high income-elasticity products, as proven by their attractiveness for FDI. Growth prospects within an enlarged European Union are difficult to predict and strongly depend on the outcome of the pending reform of the Common Agricultural Policy (CAP). Basically, access to CAP may lead to much stronger cross-border vertical and horizontal linkages (including take-overs) in the food sector.